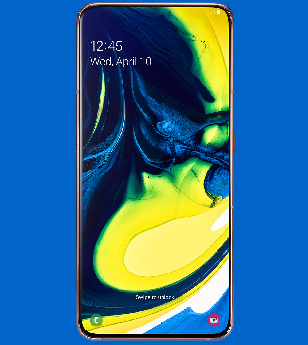 Bangkok, April 10: Heating up the race to bring innovative smartphones, South Korean tech major Samsung launched here on Wednesday the Galaxy A80 with a rotating triple camera system and a full-screen display. While an official confirmation on India availability and price of the phone is still awaited, sources told IANS that the phone will be priced below Rs 50,000 for the India market and it is “most likely” to be launched in the country next month. Samsung Galaxy S10 Flagship Smartphone Easily Fooled By User’s 3D Printed Fingerprint; Watch Video. When users select the selfie mode in the camera app, the three cameras automatically pop-up from the back of the phone and rotate. 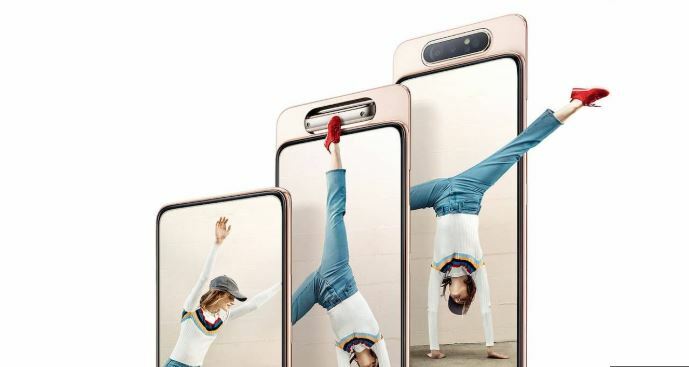 It means that the same triple sensors — a 48MP primary camera + 8MP sensor for 123 degree ultra wide angle in addition to another 3D depth sensor — can work both as the user’s primary camera as well as the selfie camera. The 3D depth camera offers “Live Focus” videos by scanning objects for measurement and depth. “The Galaxy A80 offers premium features for digital natives who want to fully engage in the ‘era of Live’,” said DJ Koh, President and CEO of IT and Mobile Communications Division at Samsung Electronics. The pop-up feature which is becoming increasingly common in smartphones now makes sure that the front sensors do not take up any space on the screen, allowing users to have maximum viewing space of the 6.7-inch FHD+ Super AMOLED “New Infinity” display for immersive media consumption. The rotating feature allows everyone to have experience of six camera lenses, while the phone has just three. Powered by the Qualcomm Snapdragon 730G processor, the phone houses a 3,700 mAH battery that comes equipped with “super-fast” charging capability. The back of the phone is protected by Corning Gorilla 6 glass, while the frame is made of metal. It has an onscreen fingerprint sensor for quick access to the apps and other phone content. OnePlus 6T Price Comes Down To Rs 33,499 During Amazon Fab Phones Fest Sale; Get Discount of Rs 4500 Before Its Gone. Samsung also unveiled at the event the Galaxy A70 which was announced late last month. The device will be launched in India this month, the sources added. Featuring a 6.7-inch Infinity-U display, the device comes with 4,500mAh battery and super-fast charging technology. Samsung India, which earned revenues of $5.5 billion from its smartphones business in the country in the 2018 financial year, announced Galaxy A20, its fourth smartphone in the Galaxy A series this year, earlier this month. “The Galaxy A Series provides a range of models so everyone can choose a device that fits their unique needs and enables them to pursue their passions,” Koh said.